Wes Shinego recalls a few of his brief visits with memorable friends. Wes Shinego is not an artist or a photographer. 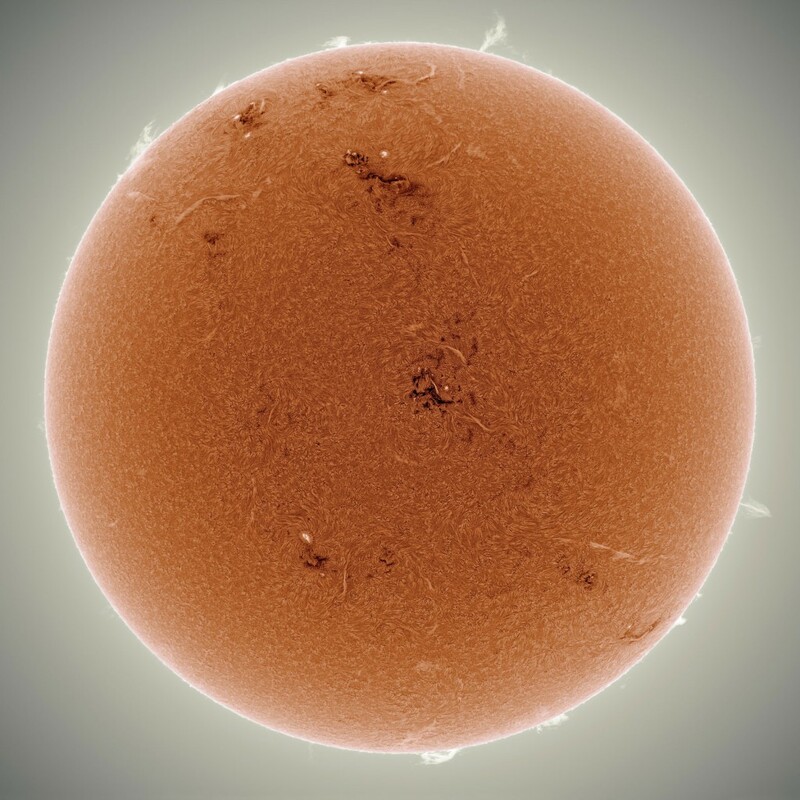 He isn’t an aquarium hobbyist either—the fish he photographs do not leave the ocean for more than a few minutes. Wes is more of an amateur naturalist—armed with a gas station-purchased diving mask, some rubber fins, a child’s scoop net, and a repurposed pickle jar, Wes has caught, photographed, and released tropical fish for over 25 years. The son of a Navy submariner, Wes spent several years of his youth in Hawaii and Florida learning the hobby of tropical fish collection from his father. To keep the game challenging and to limit their impact on the reef, scuba gear, barrier nets, and wetsuits were prohibited. Moray eel teeth, sea urchin spines, and fire coral burns taught him to be just as mindful of his body as the rest of the reef. Years later, Wes’s own military career would have him return to Hawaii, continuing his father’s game and sharing his temporary trophies with an avid community of fish enthusiasts on Instagram. We’ve asked Wes to pick a few of his favourites and tell us the story behind each encounter. ↥ One Ornate Butterflyfish (Chaetodon ornatissimus), two Longnose Butterflyfish (Forcipiger flavissimus), and one beautiful Reticulated Butterflyfish (Chaetodon reticulatus). 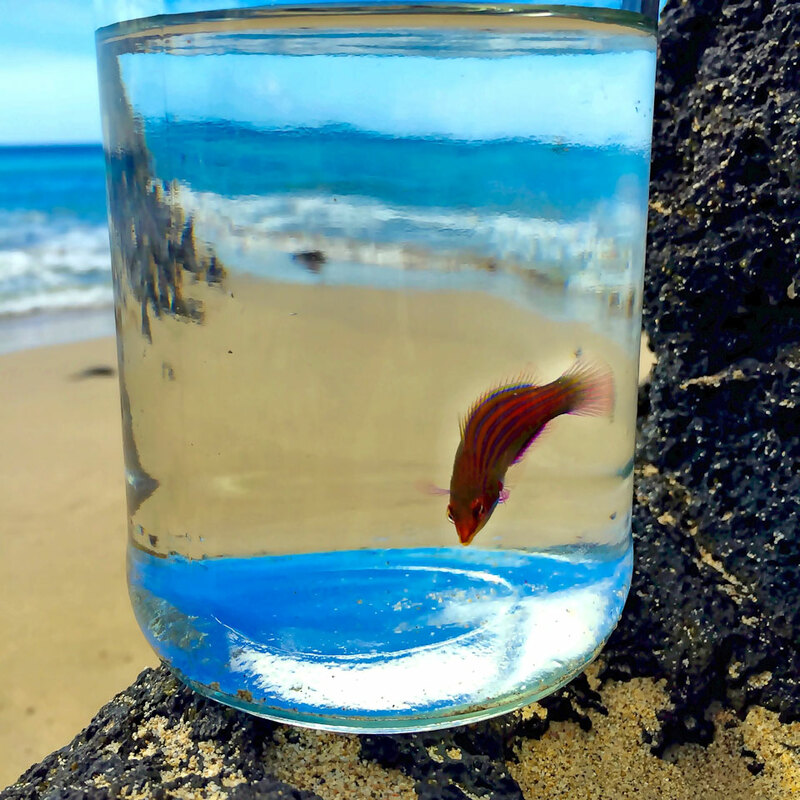 Collected and released off Makua Beach, Oahu, Hawaii. 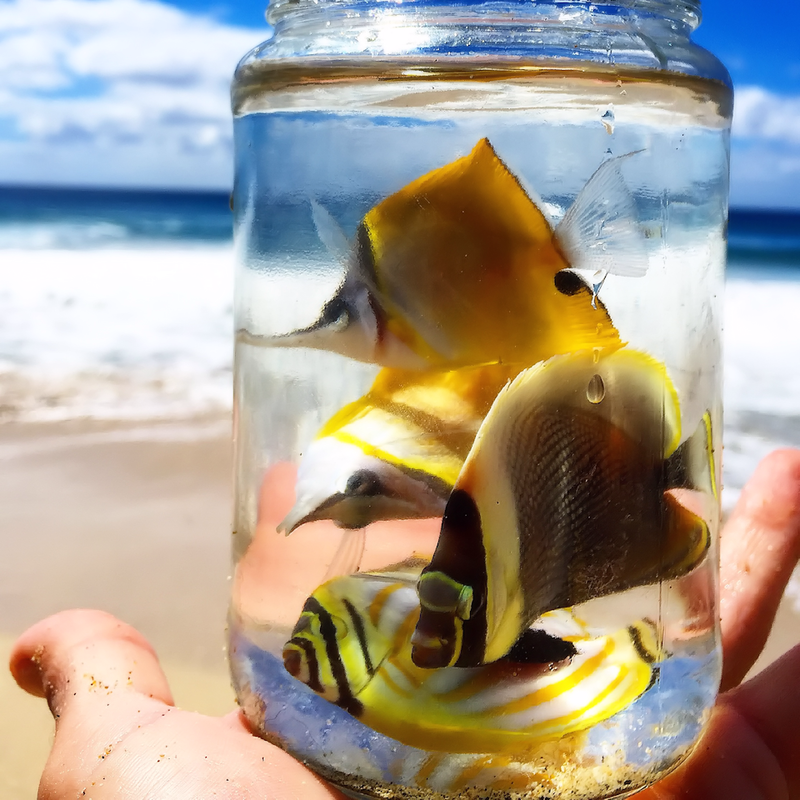 In the summer of 2014, Hawaii saw an unprecedented spike of both common and rare Butterflyfish. Reticulated Butterflyfish, common to French Polynesia but seldomly observed elsewhere, somehow found their way into my jar along with a variety of other Butterflyfish species. The sea of yellow that dominated my Instagram feed during those months represented a fraction of the specimens I encountered during the “summer-of-fish” bloom. While populations gradually receded as winter approached, I watched hundreds of juvenile butterflyfish, surgeonfish, and filefish mature into adults. By December, even humble stretches of patch reef and rubble teamed with healthy populations of reef fish. ↥ One small Day Octopus (Octopus cyanea). 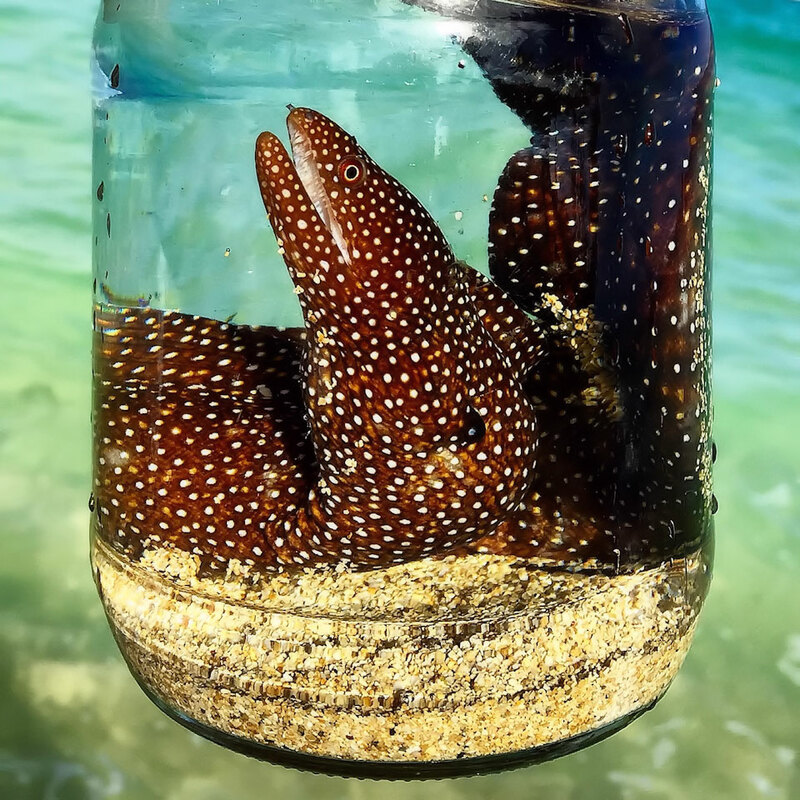 Collected and released off Lawai Beach, Kauai, Hawaii. ↥ One Fourline Wrasse (Pseudocheilinus tetrataenia). 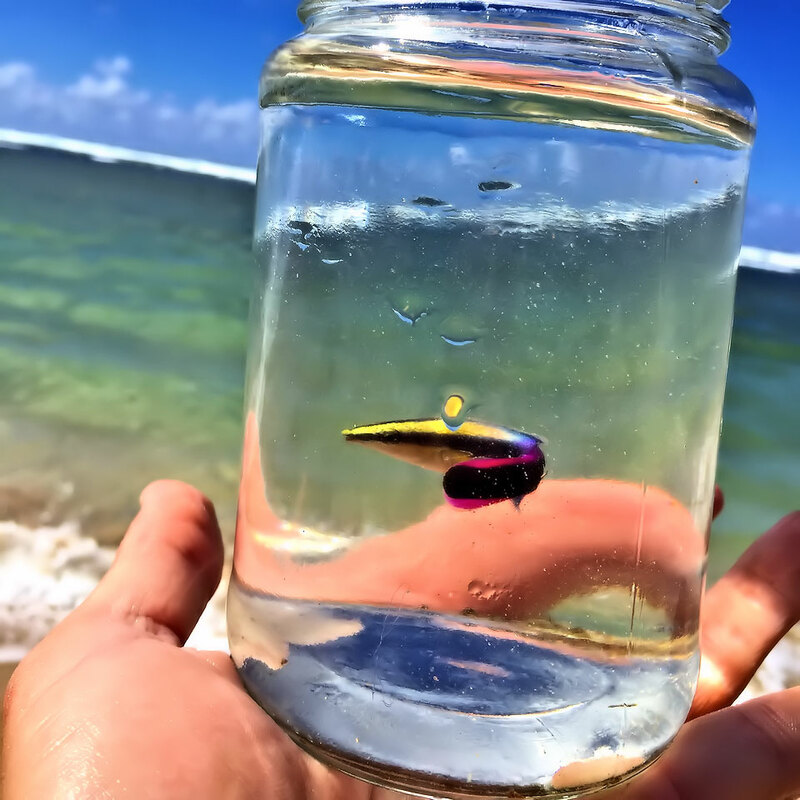 Collected and released off Makua Beach, Oahu, Hawaii. Fourline Wrasses are shy beauties infrequently spotted at the limit of my snorkeling range. Since their preferred habitat consists of dimly-lit holes beneath fifty feet of unforgiving ocean, the rare specimens I’ve been able to collect have come at the expense of my physical and psychological wellbeing. I’ve spent an entire afternoon (and cried real tears) in pursuit of a Fourline Wrasse. This particular fish left me so exhausted that I barely managed to drag my cramp-ridden body out of the water. I spent the following hour curled up on the sand until I mustered up enough strength to drive home. ↥ One sub-adult Hawaiian Spiny Lobster (Panulirus marginatus). 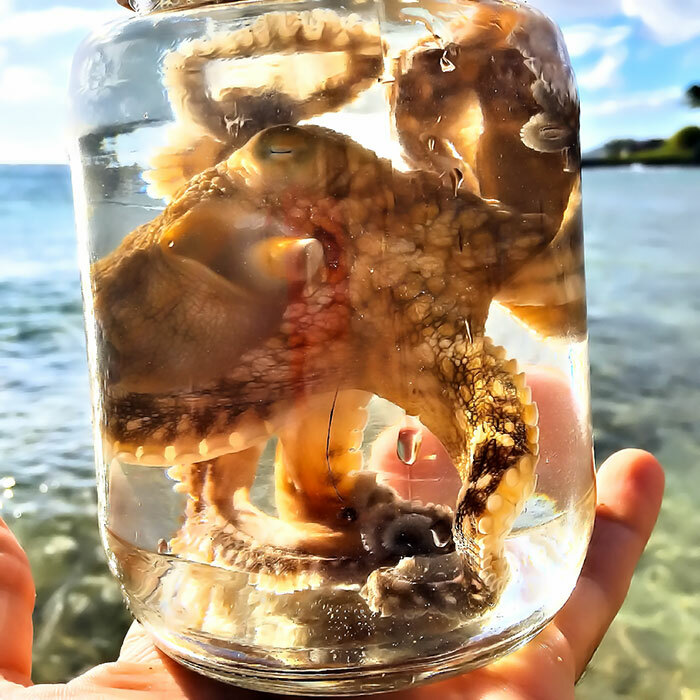 Collected and released off Aweoweo Beach Park, Oahu, Hawaii. The Hawaiian Spiny Lobster is a rare find on coastal reefs. 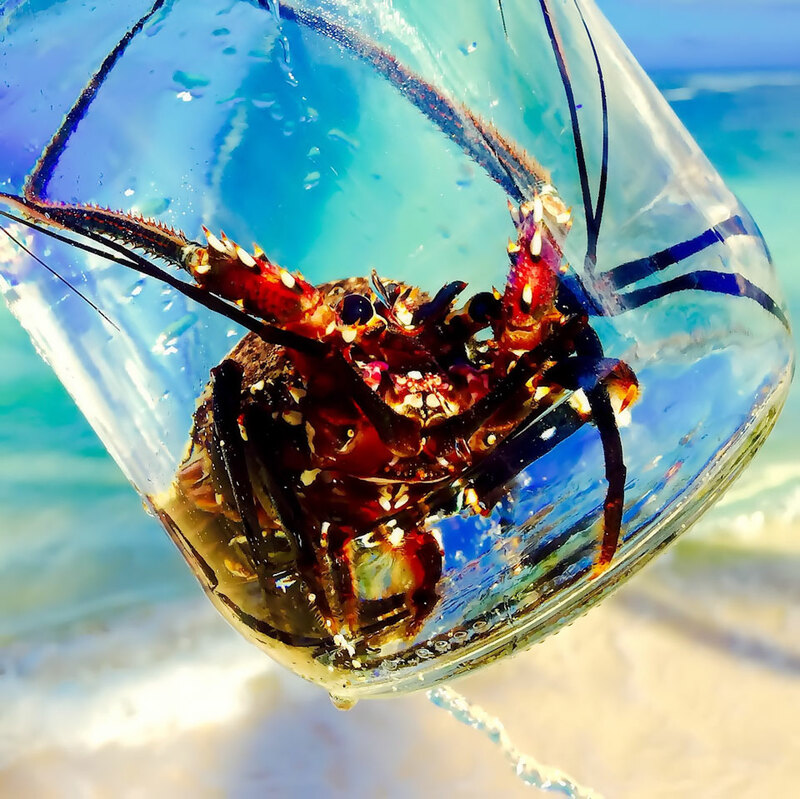 Due to poor food-fish conservation efforts, Hawaii betrayed its most populous island’s Spiny Lobsters by failing to publicize and enforce fishing seasons and restrictions. Juveniles and sub-adults are poached almost immediately following their appearance on the reef, thwarting the Hawaiian Spiny Lobster’s recovery. I’ve personally encountered only a handful of mature specimens. The species is nearly absent at popular dive spots, where it should otherwise thrive. ↥ One sub-adult Bermuda Blue Angelfish (Holacanthus bermudensis). 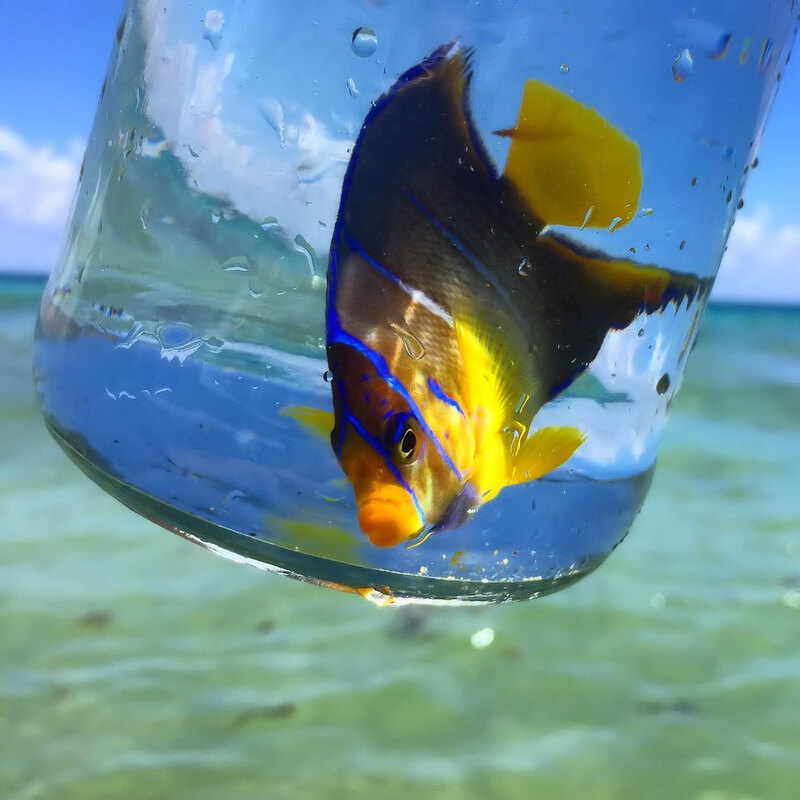 Collected and released off John C. Lloyd State Park, Dania Beach, Florida. Blue and Queen Angelfish are the crown jewels of the tropical Western Atlantic. To this day, the sight of an electric blue fin emerging from underneath a reef ledge provides me with an adrenaline-fueled rush of excitement. Recently, I braved an aggressive Bull Shark’s prolonged, unwelcome attention to continue my pursuit of the Blue Angelfish pictured above. ↥ One unhappy Whitemouth Moray Eel (Gymnothorax meleagris). 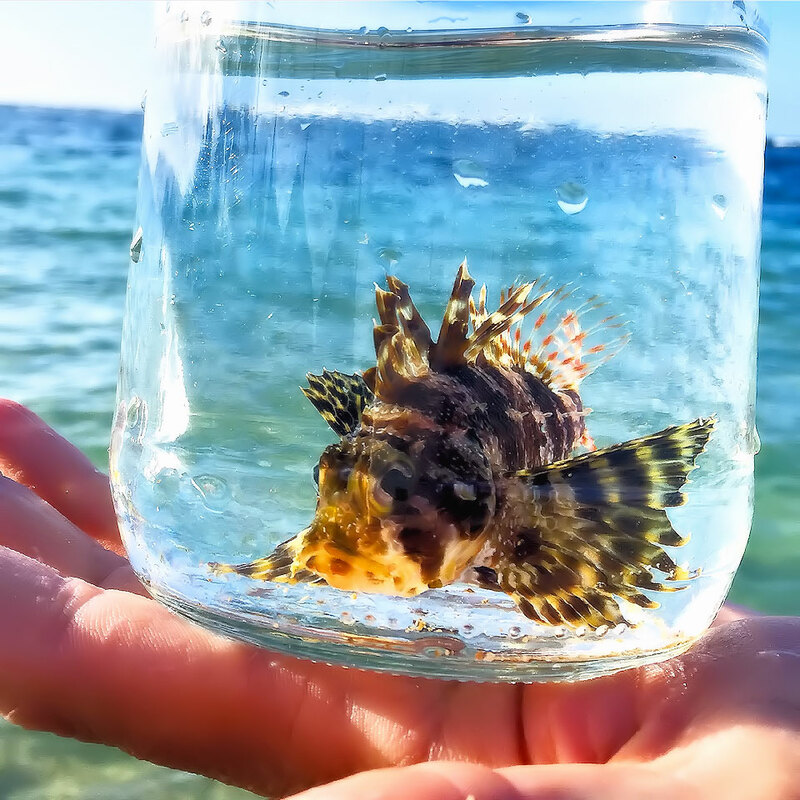 Collected and released off Aweoweo Beach Park, Oahu, Hawaii. 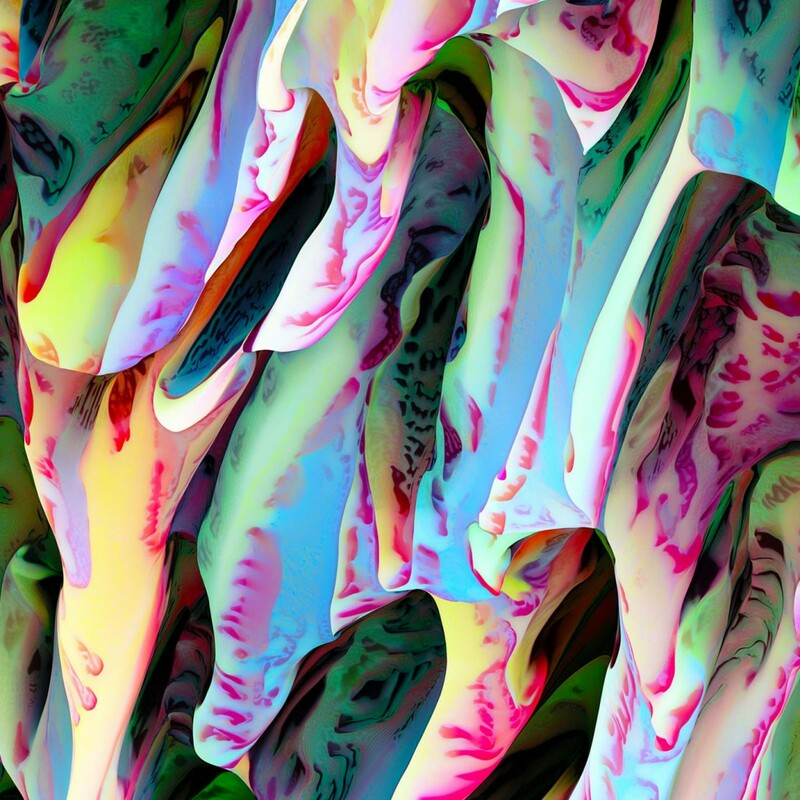 Moray eel jaws have been keeping over-reaching Shinego men honest since 1968. Though any eel can (and will) bite if provoked, only Undulated Moray Eels have attacked me for approaching their “space.” Moray eels reportedly suffer from poor eyesight, but tell that to the Undulated Moray who met me at the water’s surface and bit down on my exposed finger. In the panic that ensued, I was forced to use an entire tax-payer funded Army combat casualty kit to stop the bleeding. Most morays go out of their way to avoid people. Despite this tendency, moray eels have a habit of swimming directly into an open net when pursued, but I dare you to try and get them into a jar. ↥ One Hawaiian Green Lionfish (Dendrochirus barberi). Collected and released off Aweoweo Beach Park, Oahu, Hawaii. This venomous Hawaiian endemic prefers shallow patch reefs such as those off Aweoweo Beach Park. I sometimes “find” these specimens with my exposed fingertips. Their relentlessly painful sting gives way to some feverish hallucinations and general confusion that might ruin your afternoon. On the bright side, Hawaiian Green Lionfish tend to photograph well. ↥ One juvenile French Angelfish (Pomacanthus paru). 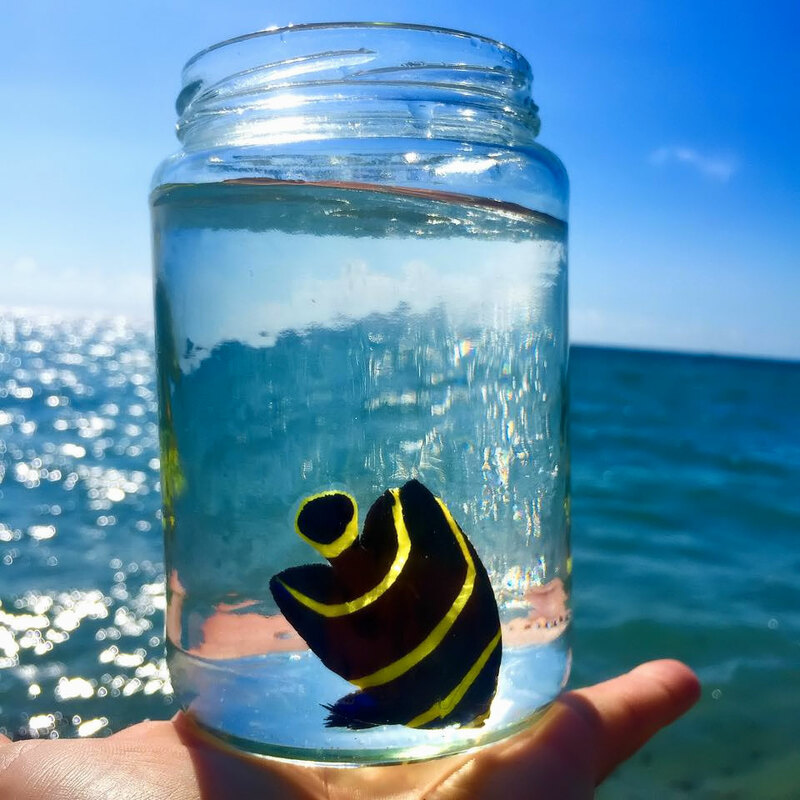 Collected and released off John C. Lloyd State Park, Dania Beach, Florida. My three-year Hawaiian odyssey ended in December 2014 after I received orders to Fort Gordon, Georgia. Determined to make the best of crummy situation, I adapted my daily Hawaiian diving regimen to a series of weekend road trips to South Florida. Both my father and I spent our high school summers catching juvenile French Angelfish off the Florida coast. Twelve years since I’d last visited, the Fort Lauderdale reef line I’d frequented as a teenager appeared healthy—with coral, fishes, and apex predators in abundance and seemingly fearless. ↥ One Hawaiian Cleaner Wrasse (Laborites phthirophagus). 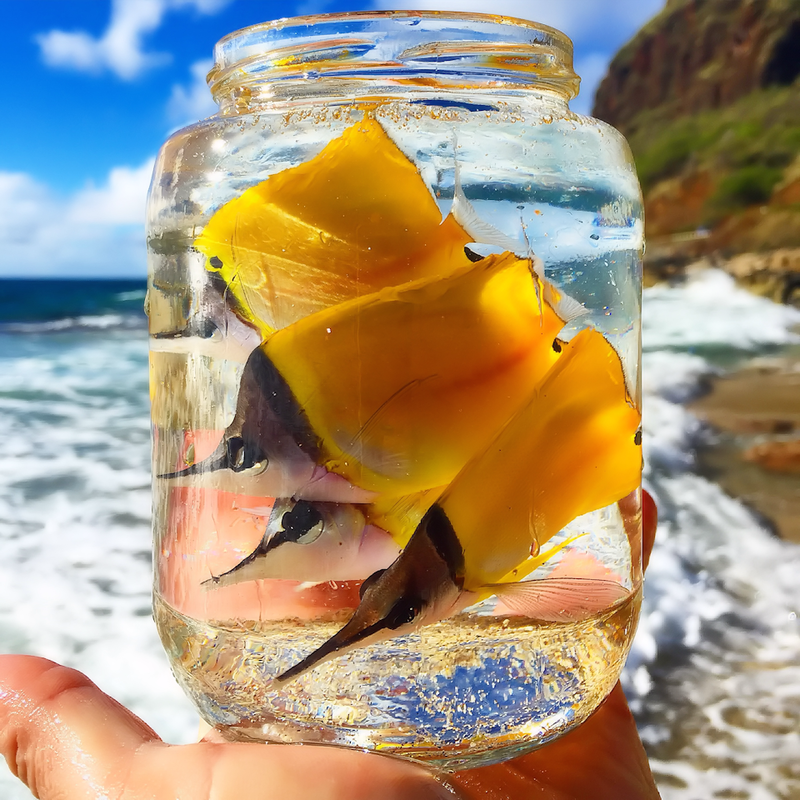 Collected and released off Aweoweo Beach Park, Oahu, Hawaii. I signed a lease in Waialua during my final year in Hawaii based solely on the apartment’s proximity to Aweoweo Beach Park. The unit was overpriced, poorly maintained, and didn’t have a kitchen. Still, I enthusiastically paid twelve months rent because the dump provided on-demand access to Oahu’s best kept snorkeling secret. During World War II, the U.S. Army experimented with several varieties of anti-tank obstacles—most of which were abandoned by the war’s end. Several dozen of these concrete obstacles were retired off Waialua, Hawaii, attracting corals, fishes, and a robust sea turtle population. One of my favorite past times became “checking up” on territorial fish I’d previously caught and released. Over several months, I watched in amazement as one particular Hawaiian Cleaner Wrasse diligently manned the same cleaning station he’d founded as a tiny juvenile. My favorite Hawaiian Cleaner Wrasse grew into a healthy adult before finally abandoning his post to find a Mrs. Hawaiian Cleaner Wrasse. Just days after the wrasse’s departure, I spotted his relief—a tiny juvenile arrived at the cleaning station to continue his predecessor’s work.